This is a scalable context timeline. 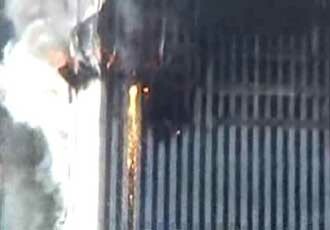 It contains events related to the event (9:50 a.m.) September 11, 2001: Molten Metal Pours from South Tower. You can narrow or broaden the context of this timeline by adjusting the zoom level. The lower the scale, the more relevant the items on average will be, while the higher the scale, the less relevant the items, on average, will be. 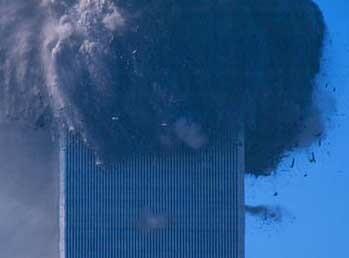 Steven E. Jones, a physics professor from Utah, will claim this molten metal is “direct evidence for the use of high-temperature explosives, such as thermite,” used to deliberately bring down the WTC towers. [MSNBC, 11/16/2005] He will say that without explosives, a falling building would have “insufficient directed energy to result in melting of large quantities of metal.” [Deseret Morning News, 11/10/2005] There will be no mention whatsoever of the molten metal in the official reports by FEMA, NIST, or the 9/11 Commission. [Federal Emergency Management Agency, 5/1/2002; 9/11 Commission, 7/24/2004; National Institute of Standards and Technology, 9/2005] But Dr. Frank Gayle, who leads the steel forensics aspects of NIST’s investigation of the WTC collapses, will be quoted as saying: “Your gut reaction would be the jet fuel is what made the fire so very intense, a lot of people figured that’s what melted the steel. Indeed it didn’t, the steel did not melt.” [ABC News 7 (New York), 2/7/2004] As well as the reports of molten metal, data collected by NASA in the days after 9/11 finds dozens of “hot spots” (some over 1,300 degrees) at Ground Zero (see September 16-23, 2001). A poll by Ohio University and Scripps Howard News Service finds that a significant minority of Americans believe there was US government complicity in the 9/11 attacks. Thirty-six percent of the 1,010 respondents say they believe that US government officials “either assisted in the 9/11 attacks or took no action to stop the attacks because they wanted the United States to go to war in the Middle East.” Sixteen percent believe that secretly planted explosives brought down the Twin Towers, and 12 percent believe a military cruise missile, rather than a hijacked aircraft, hit the Pentagon. [Scripps Howard News Service, 8/3/2006; San Francisco Chronicle, 9/3/2006] An earlier poll had found that half of New York City residents believed government officials knew in advance of the attacks and consciously failed to act (see August 30, 2004). 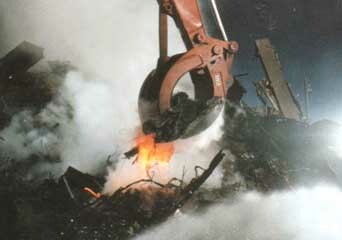 In answer to the question of “Why was physical evidence not collected immediately following the collapse of the WTC towers,” NIST says, “In the initial days and weeks following the WTC disaster, the emphasis was on rescue and later on recovery, necessitating the removal of steel and disturbing the collapse site.” It adds, “NIST did not receive the legal authority to collect and preserve physical evidence from a disaster/failure site until the National Construction Safety Team Act became law in October 2002.” The decision to rapidly scrap the remaining steel from the WTC was made shortly after 9/11 (see Shortly After September 11, 2001), but the destruction of this steel was strongly protested by some within the engineering and firefighting communities (see December 25, 2001 and January 4, 2002). In answer to the question, “Why didn’t NIST fully model the collapse initiation and propagation of WTC towers?” NIST says, “Once the collapse had begun, the propagation of the collapse was readily explained without the same complexity of modeling” as was used to determine the sequence of events leading up to the collapse initiation.